Between last weekend’s snow and the storm that swallowed up most of this week, we had one day of reprieve. Monday it was warm and clear, which was mighty good timing as it was also the night of EBC‘s Starlight Ride, where a bunch of us rode to the observatory at the U of A to look at the stars, Jupiter and its moons, craters on the moon, as well as spotting a few meteorites along the way. 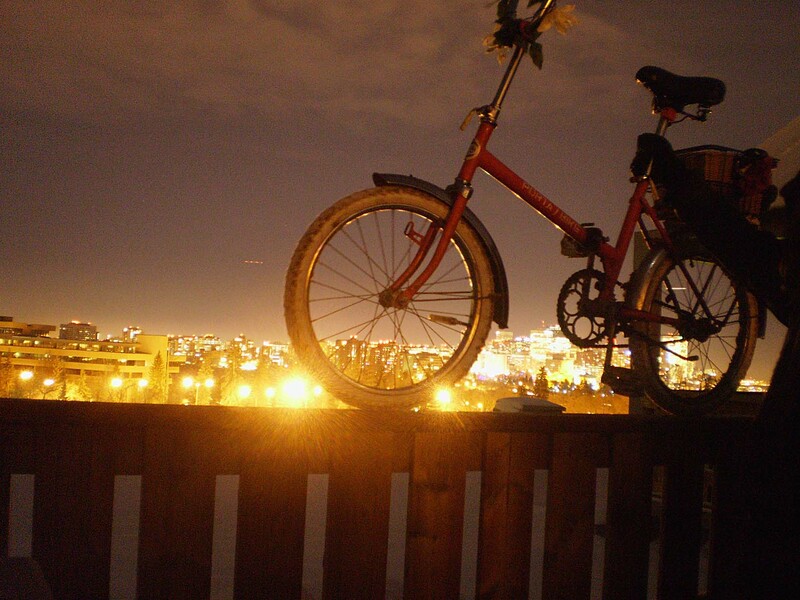 Polar Porta Bike on the roof of FAB near the observatory. 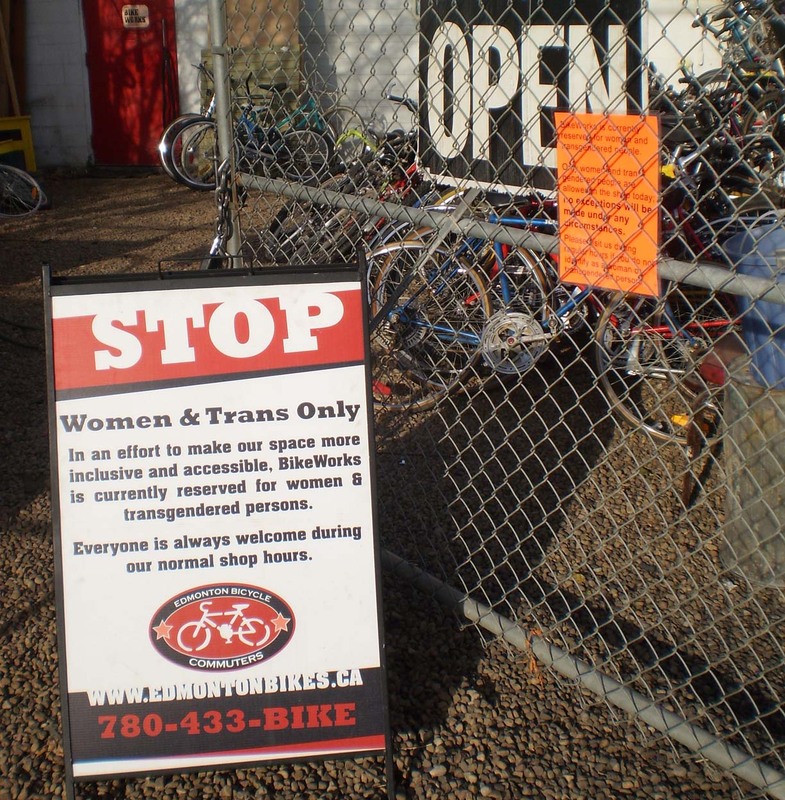 Over all, more than two dozen people met up at the observatory, most riding (including some folks who were new to winter cycling), and some using transit. The ride was warm compared to standing around on the rooftop, and the little space heater beside the telescope was very much appreciated. 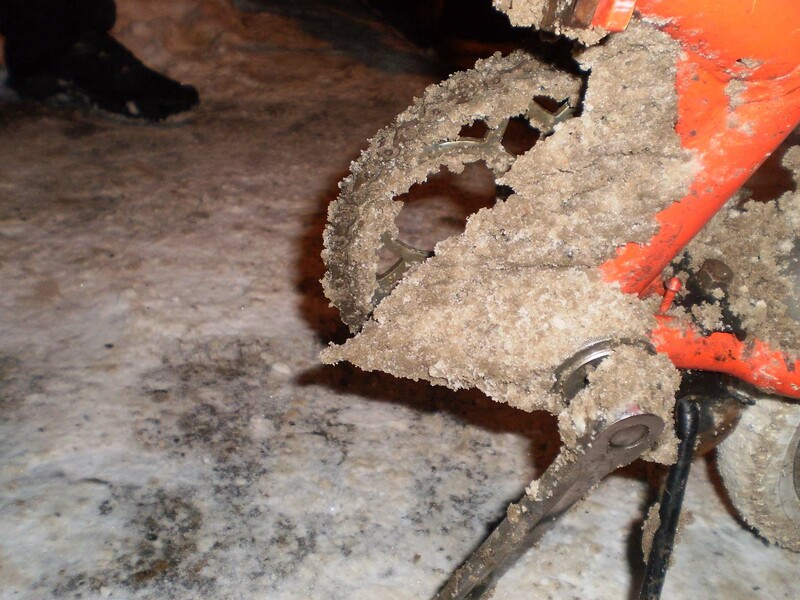 With the weather warming up a little, the snow on the roads softened up, creating the strangest gravity defying buildup on my bottom bracket. How does slush get pointy, anyway? Unnatural brown sugar bottom bracket deposit. This photo does little justice to the huge amounts of snow that had collected on my sweaters. The snow didn’t stop all night, and the wind soon joined it. By the next morning, anything that had been unburied the night before was whited out, and though the snow was still coming down, it was hard to tell how much of it was falling and how much had already fallen to the ground and was just getting whipped around by the wind. 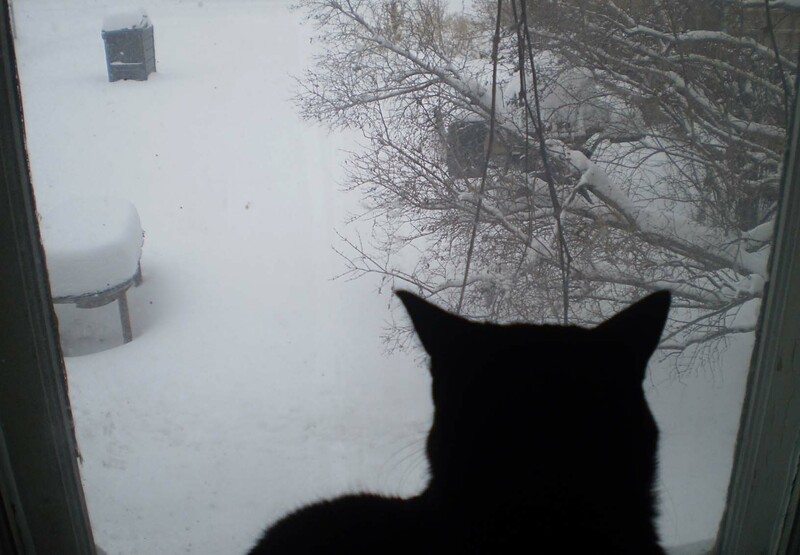 Sassy surveys the snow that could engulf her over her ears. I was wishing I could just stay in bed and cuddle the kitties for just one day until the roads were in better condition or people had a chance to clear the sidewalks, but this is one of the busiest weeks of the year where I work, so I still had to get there somehow. 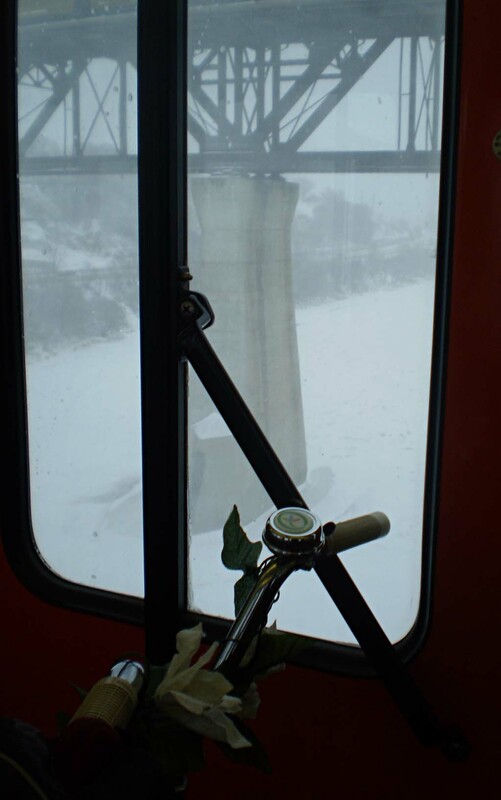 I was pretty sure the bike paths wouldn’t be plowed, and even if they were, they would be drifted over in no time, so I opted to hop on the LRT with Porta Bike. Polar Porta Bike goes multi-modal. 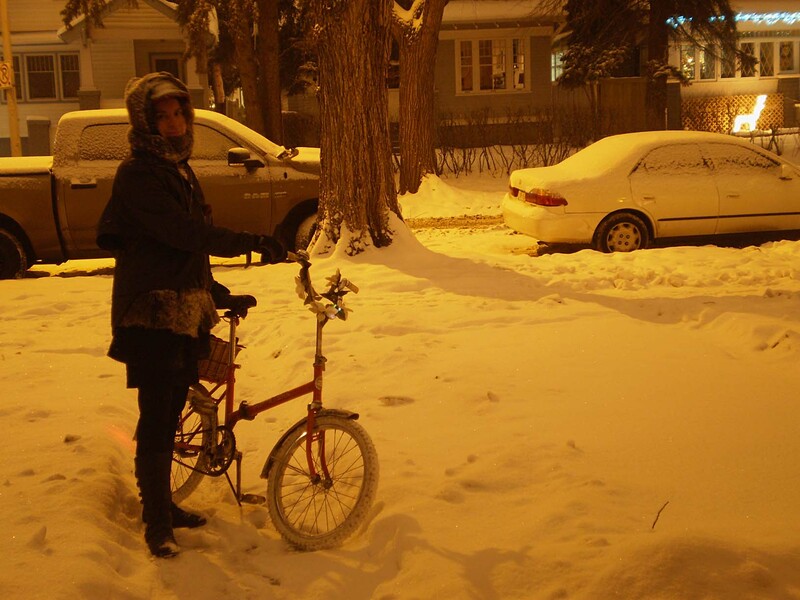 Even though I did have to get off and carry the bike over a few snow banks, riding the bike was still more efficient than if I’d waited for the bus or walked the last leg of my journey. The main streets and bus routes had been plowed, and even though there was still lots of slippery brown sugar and oatmeal snow (this is the kind of oatmeal and brown sugar I prefer not to start my day with, thank-you), the Polar Porta Bike handles it better than any other bike I’ve ridden. 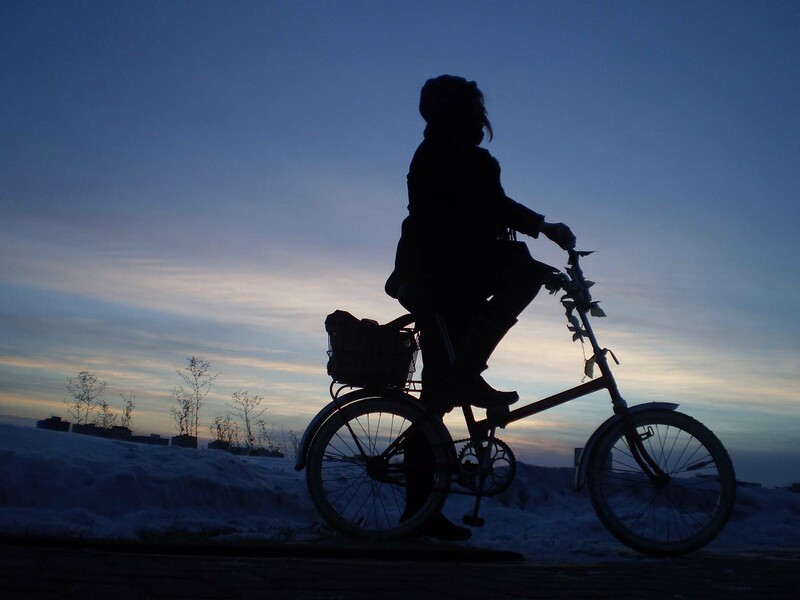 After one day of mass transit assisted commutes, I was back biking the full 20km round trip. I ordered a new set of white nubby tires (this bike would’ve originally come with white tires) and studded both of them, so I now have one of the most unique (and awesome!) winter bikes ever. Between all the studs and the rough road conditions I’m not moving nearly as fast as I’m used to, but I’m still moving and getting to my destinations as reliably as anything fueled by gasoline. I’m so happy with Polar Porta Bike that I even did something I’ve never done before, and added festive decorations to it. 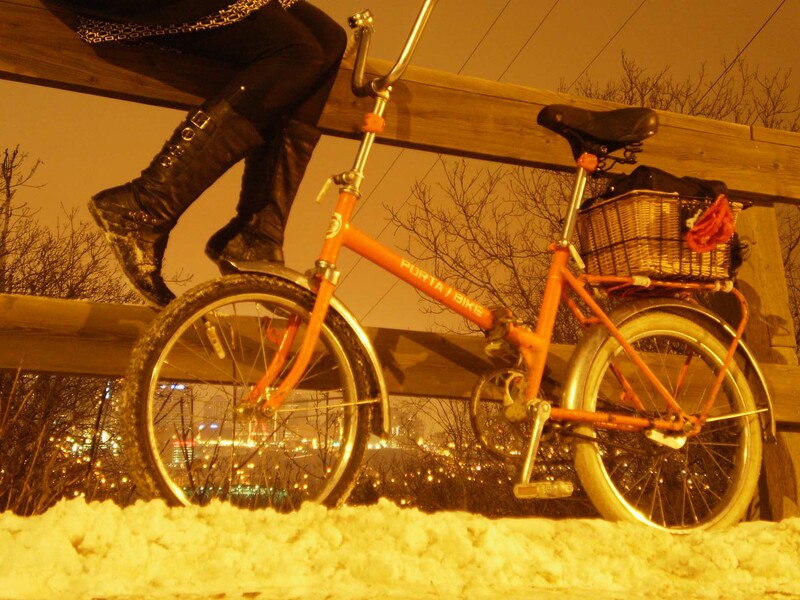 Few sights are as sweet as a plowed bike path after a storm lightly dusted with sparkly snow. Also, white 20" studded tires FTW! As I write this, the snow is still falling, and the plows are still rolling. 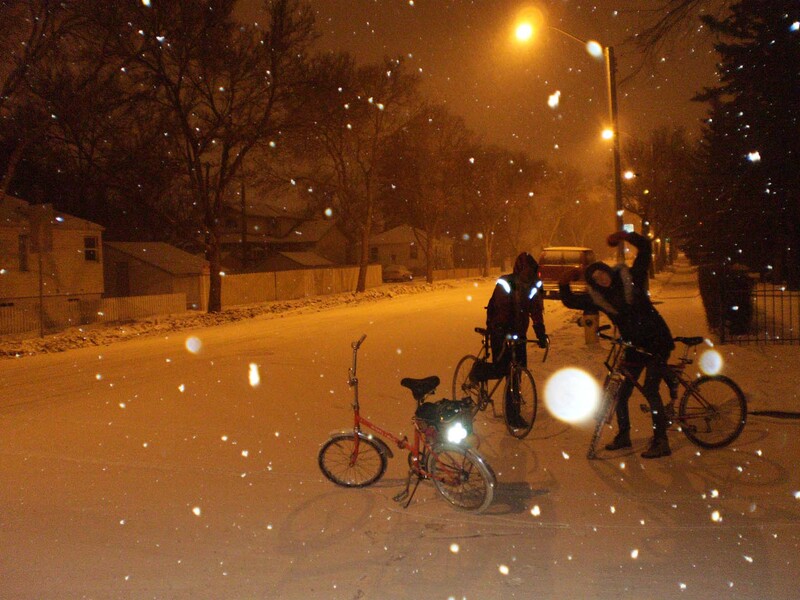 A lot of folks have been acting like riding a bike in this weather is a hardship, but in reality it’s so fun! Sure it’s a bit of a workout, but I’m never too cold (actually, I get pretty sweaty), and I always feel better for the exercise. I can’t count the number of times this week I’ve been offered rides by well meaning folks, who think I’m crazy for riding. If only they knew what they were missing. 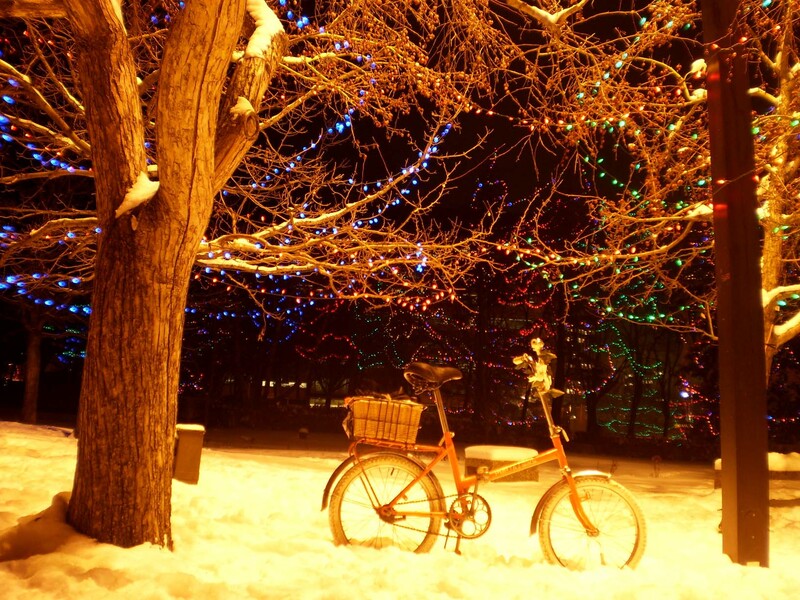 The landscapes covered in sparkly fresh snow alone assure me that I’d be nuts to pass up an opportunity to ride. 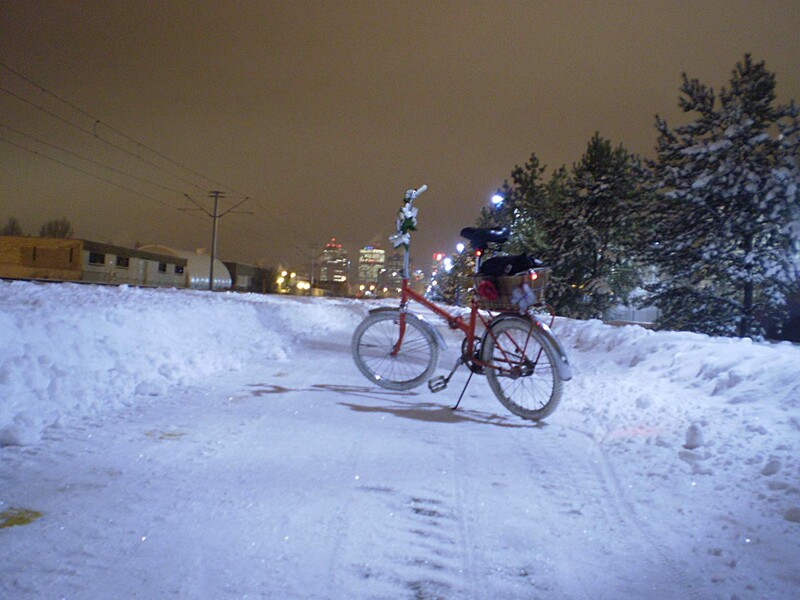 I love night time rides in fresh snow, while the rest of the city sleeps. The fluffy blanket of sparkly snow covers the streets and absorbs the city noises, and it’s so much easier to ride through before cars and sanders churn it into brown sugar.